“They’re madly in love.” “He’s crazy about her.” “It’s a match made in heaven.” These phrases are a part of our everyday vernacular. Just as some old wives’ tales have been found to have a basis in truth, these phrases describe the feeling of being in love. When a friend’s behavior takes a complete one-eighty when she falls in love, she DOES seem somewhat mad. When a guy eschews the weekly poker game with buddies to change the oil in his new girlfriend’s car, his friends declare him crazy. So, the following are earnest attempts to define this age-old mystery. Here are my top ten quotes about love and relationships that are great for any couple. “One day you will kiss someone and know those are the lips you want to kiss for the rest of your life. – Author Unknown.” We can all agree that love is certainly serendipitous, defying logic. A beautiful, intelligent, sensitive man may leave a girl feeling ambivalent. Weeks later, she has a brief conversation with the man who services her father’s car, and her heart is his forever. Some say “the heart wants what the heart wants.” There is no on-line match service or professional matchmaker that can produce that illogical, initial flight of the heart. 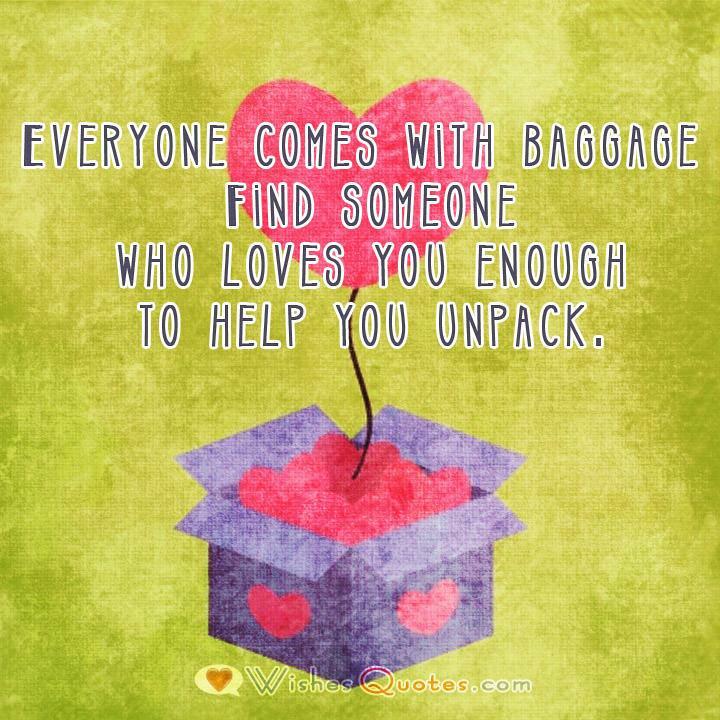 “Everyone comes with baggage. Find someone who loves you enough to help you unpack. – Author Unknown.” Real and lasting love involves wanting the best for that partner. Accepting their emotional baggage while they in turn try to overlook the cumulative emotional quirks that you bring to the relationship. It’s such a satisfying feeling to share your life with someone who sees, acknowledges and helps to put your emotional baggage into perspective. It’s as if, in spending time with the love of your life, you soul can finally take a big sigh of relief and set that heavy luggage down. “Fall in love with someone who’s comfortable with your silence. Find someone who doesn’t need your words to know it’s time to kiss you. – Clairabelle Ann.” Have you ever met someone (paramour, used car salesman…) who seems to be saying all the right things, yet you can feel the insincerity. Their rhetoric falls on deaf ears. Conversely, someone who truly cares can move you to tears with a subtle glance. Real love, real connection doesn’t always require words. Someone who shares your soul just knows to take your hand when you’re hurting. 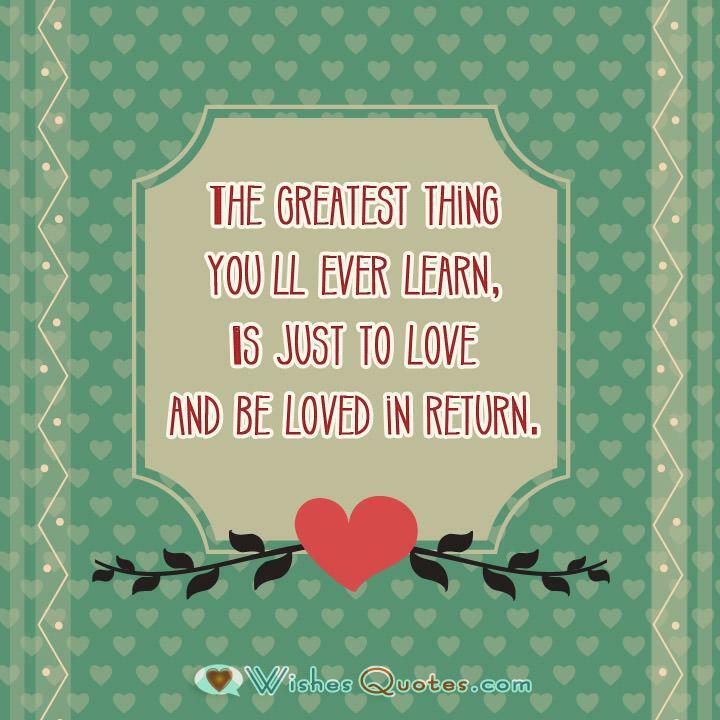 “The greatest thing you’ll ever learn, Is just to love and be loved in return. – Eden Ahbez.” Sometimes we expend so much energy trying to learn our job and analyze every relationship, we lose sight of what’s important right in front of us. Our child jumps in a puddle and instead of recognizing the joy in this simple act, we scold him for getting wet. When our lives approach the end, the one we love most in the world will not remember the professional coup you executed at work — they’ll remember the growth that you both shared in the simple exchanges of love. 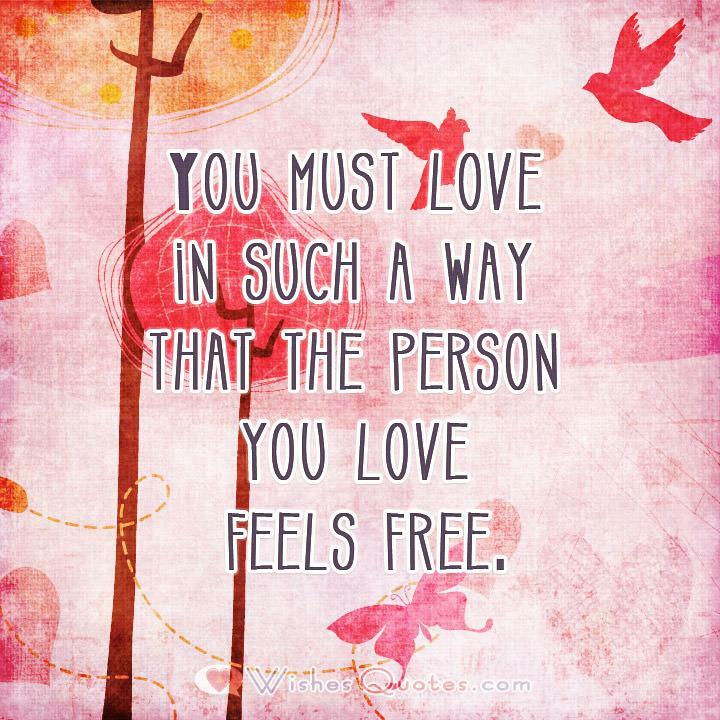 “You must love in such a way that the person you love feels free. – Thich Nhat Hanh.” We know that hammering a round peg into a square hole is an exercise in futility, not to mention painful for the peg! The best words an artist, interior designer, or hair designer can hear is “do whatever you want.” It’s a freeing feeling. It’s a cherished gift to the one we love to say “Be whoever you are, and I will love you for it.” Freedom to be ourselves and the knowledge we will be embraced for it is the most loving gift. 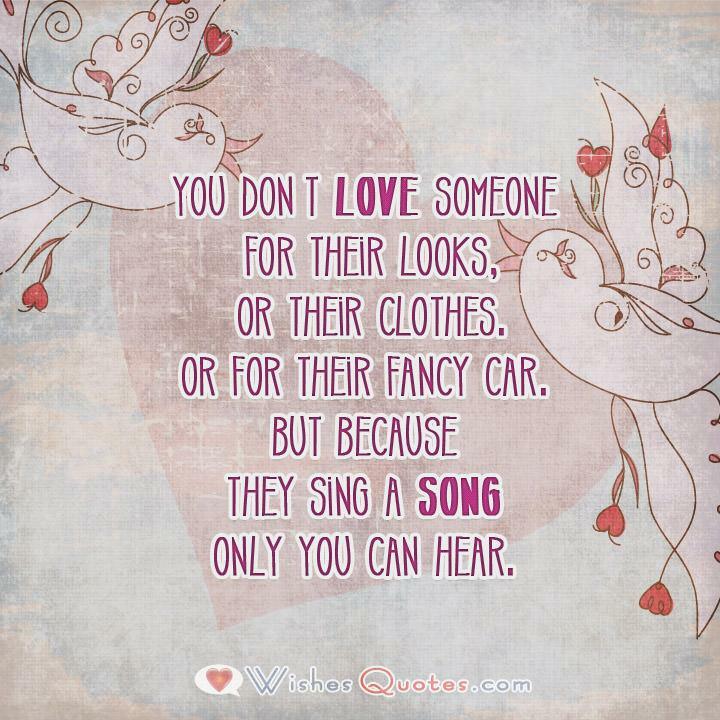 “You don’t love someone for their looks, or their clothes, or for their fancy car, but because they sing a song only you can hear. – Oscar Wilde.” You meet a person for the first time, look them critically up and down, and unconsciously decide they’re average looking, or perhaps unattractive. Often, after we spend time with this person, understand their values, experience their humor and generosity, we will describe them to others as beautiful. When someone says “I don’t know what he sees in her,” it doesn’t really matter because HE sees the beauty. “Find arms that will hold you at your weakest, eyes that will see you at your ugliest, lips that will kiss you in both instances, and a heart that will love you at your worst. 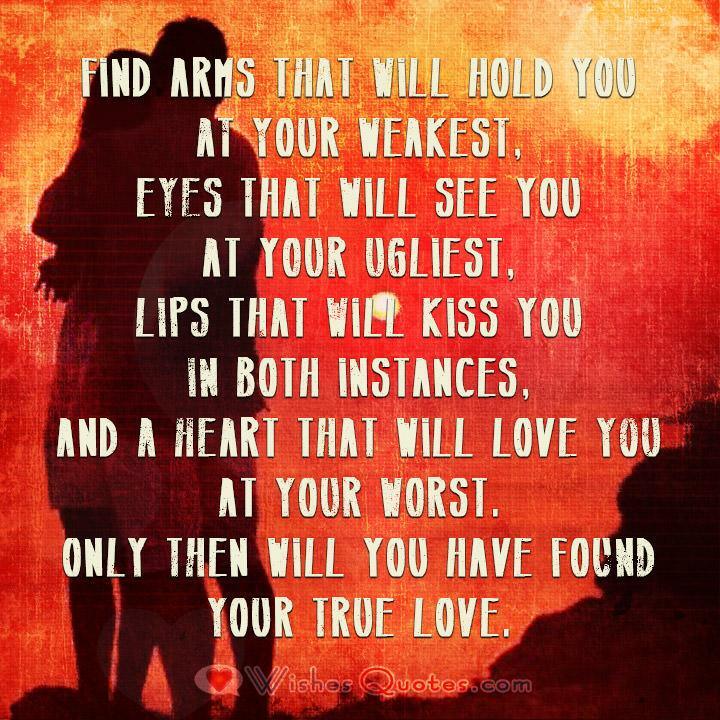 Only then will you have found your true love. – Author Unknown.” When the true love of your life sees you struggling with the flu, he doesn’t say “Oh yikes, I’ll call you next week.” He stays and makes your favorite soup and launders your smelly blanket. When you make stupid mistakes, you fail miserably and you appear foolish, he doesn’t shake his head in disgust, he helps you overcome and rise above it. Love doesn’t disrespect, it supports and helps guide the journey forward, no matter how rough the road may be. “If he makes you laugh, kisses your forehead, says he’s sorry, makes an effort, holds your hand, works hard, attempts to understand you… then believe it or not, he’s quite perfect. – Author Unknown.” In an effort to find that “perfect” person to construct what I envision as a perfect life, I may overlook the REAL value in a person. After all, what makes me feel I deserve perfection in a mate when I’m as flawed as any other human being? What I should hope and pray for is someone who accepts his flaws, and mine, and embraces me as we stumble through life together, laughing at our wonderful imperfection. “Relationship is an art. The dream that two people create is more difficult to master than one. – Don Miguel Ruiz.” Loving, lasting relationships are sometimes arduous paintings. Together, we add our own colors, blend, wipe away mistakes and compromise on our different visions. The hope is that when we stand back and assess our lives after years of creating and blending, the finished work is nothing less than breathtaking. Dashing off a painting by myself may be easy and stress-free, but not nearly as fulfilling and rich as a successful and committed team effort.